One of the most effective forms of marketing, especially around the festive season, is email marketing. Being able to send information about your latest offers directly to a potential customer's inbox is extremely effective. Remember, you can only send marketing emails to users who have explicitly opted in to receive your newsletter. Do not buy email lists and always remove email addresses immediately when they unsubscribe. As email marketing is so effective, you can be sure that your competitors will be sending out their best deals too so it's vital that you stand out against the crowd and deliver copy which will attract attention. We've picked out a handful of great newsletter examples from last Christmas and New Year to show you how your email campaigns can boost your sales this year. A huge concern for Christmas shoppers is whether or not they'll receive their order in time for Christmas day. As well as making your delivery information clear and easy to find, you can tell your customers directly about your delivery cut off dates using email marketing. It's often a case that customers assume that they've already missed the final delivery date in time for Christmas, so emailing to reassure them is an easy way to bring customers back to your store. 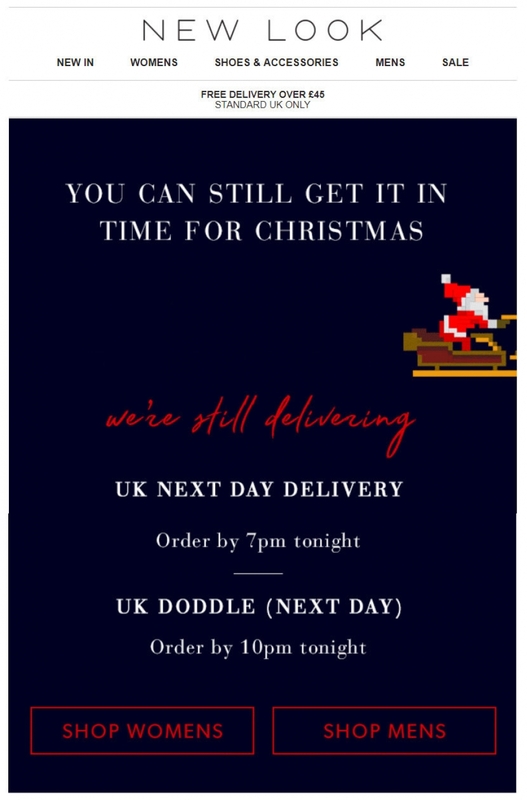 British clothing retailer New Look promoted their final date perfectly last year with a last minute reminder that you could still get next day delivery up to as late as 10pm on December 23rd. This last minute email and later than usual delivery option put New Look ahead of their competitors who had already passed their final delivery date, and allowed New Look to attract a flood of last minute orders. There are always lots of people who leave their Christmas shopping until the very last minute, so make their lives easier by sending gift guides and gift ideas directly to their inbox. Show popular products, any offers you currently have running and direct links to popular categories to make the shopping process quick for shoppers in a rush. Popular brand Superdrug showed a great way to present last minute gift ideas to customers last year. Clear, attractive images and bright offer call to actions make it easy for customers to see popular gifts at enticing prices. This email campaign also encourages customers to visit Superdrug's stores even after it's past their final delivery date. If you have a brick and mortar store, we'd highly recommend including a clear call to action with a direct link to your store locator. Email marketing is one of the most effective ways to promote repeat purchases from your exiting customers. Repeat customers generally have a significantly higher value per order, so don't make the mistake of only targeting new customers. If your store is well established and has a strong customer base, reward customer loyalty by offering them exclusive access or offers which aren't available to brand new customers. 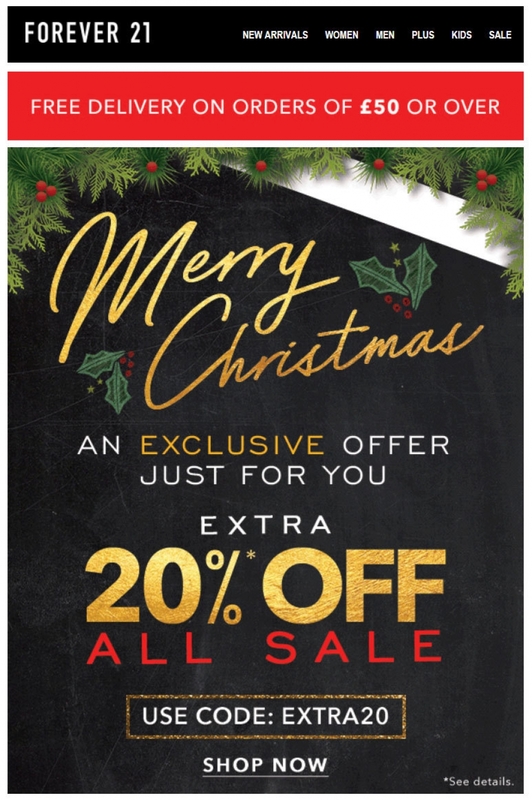 In the email campaign below, Forever 21 sent their existing customers a code for an additional 10% off their sale prices - not only creating an exciting discount but also making the customers feel valued. Their tagline, "an exclusive offer just for you", helps to reiterate the feeling that the store is rewarding them personally. Paired with this offer, Forever 21 has cleverly included an eye-catching free delivery banner - using multiple offers side by side in email marketing campaigns and be the extra nudge a customer needs to place an order. A technique which is becoming more and more popular with stores is starting Boxing Day sales early online. Even if your brick and mortar stores are closed for Christmas Day, there's no reason why your ecommerce store can't stay open and run by itself. Giving early access to the sale draws in shoppers who want to get the best products and the cheapest prices before they sell out, as well as appealing to those who would usually avoid going shopping on Boxing Day. 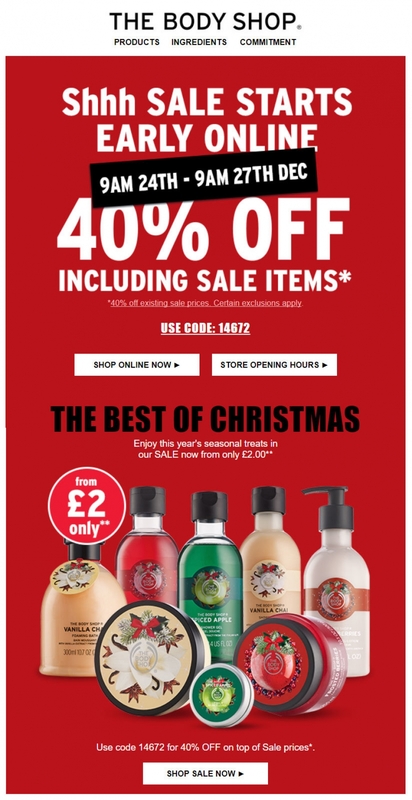 By doubling up their sale by offering 40% off sale prices too, The Body Shop's email creates an offer which is difficult to say no to. The confined time limit for the sale creates a sense of urgency, reducing the risk of the customer ignoring the email. Having a sale page containing thousands of products can be overwhelming and can result in shoppers getting bored and leaving before making a purchase. Your website and marketing campaigns should include clear categories to help your customers find the products they're most interested in - don't just link to a single, general sales page. In New Look's example below, they've not only advertised how large their sale is but they've listed their key categories so that the first sale page the user goes to will contain items suited to them. Order your categories by popularity and use larger, more obvious buttons for your most popular ones. If your business is in an industry which is highly competitive around the festive period, it's essential that you email your customers in the lead up to Christmas and New Year's Eve to ensure that you're fresh in their minds and to make them aware of your key selling points. 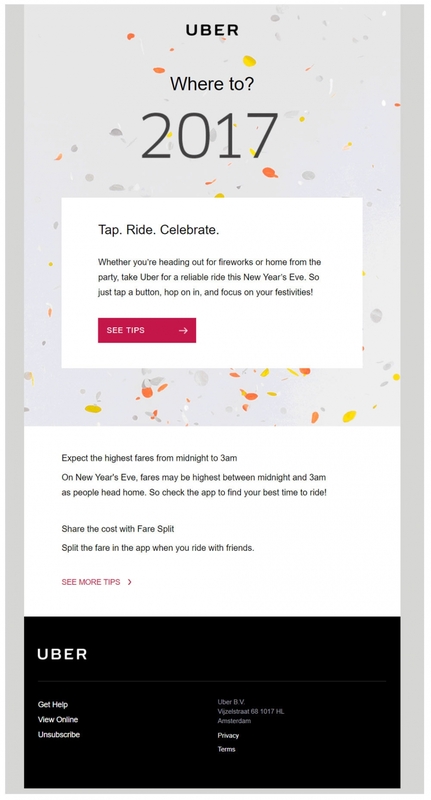 Private car company Uber expertly promoted their key features by addressing common issues riders may have with standard taxi services on New Year's Eve and tips on how to avoid them. The email was sent out just before the evening of New Year's Eve, making it extremely effective. No matter what industry you're in, email marketing can be any extremely effective way to draw customers to your website. So, what're you waiting for? Get started on your email marketing campaigns now and plan your marketing strategy before it's too late. For help and advice on how to effectively create email marketing campaigns, get in touch with our friendly team.